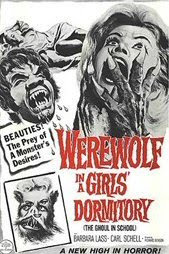 Surprisingly competent and enjoyable little low-budget Austrian/Italian werewolf flick (best known here in the states as WEREWOLF IN A GIRL'S DORMITORY). The stunningly gorgeous Barbara Lass (who was once married to Roman Polanski and then to PEEPING TOM star Carl Boehm!) is Priscilla, one of many young women doing time at a "dormitory" (actually an all-girl juvenile detention center). Priscilla starts getting suspicious when a chum of hers named Mary is found viciously murdered; the wounds inflicted looking strangely beast-like. Turns out Mary had been carrying on affair with a married teacher (Maurice Marsac) and then tried to blackmail him, which may or may not actually have something to do with her death. Add to the mystery a suspiciously stern headmaster (Curt Lowens), newly-arrived science teacher Julian Olcott (Carl Schell), who gets the hots for Priscilla, a female professor (Maureen O'Connor) who may have the hots for Julian and Luciano Pigozzi (credited as "Alan Collins") getting a jump start on his horror career playing the strange Peter Lorre-ish caretaker at the school. It plays out like a mystery with nearly the entire school staff suspect of being the killer. Make-up effects are minor but passable. Though the dubbing is sketchy, the performances aren't too bad. And then there's that great theme song called "The Ghoul in School..."